Habit: Annual, perennial herb, subshrub, generally twining or trailing. Leaf: 0 or alternate. Inflorescence: cyme or flowers 1 in axils; bracts subtending flowers 0 or 2. Flower: bisexual, radial; sepals (4)5, +- free, overlapping, persistent, often unequal; corolla generally showy, generally bell-shaped, +- shallowly 5-lobed, generally pleated and twisted in bud; stamens 5, epipetalous; pistil 1, ovary superior, chambers generally 2, each generally 2-ovuled, styles 1--2. Fruit: generally capsule. Seed: 1--4(6). Genera In Family: 55--60 genera, 1600--1700 species: warm temperate to tropics; some cultivated for food or as ornamental (Ipomoea). Note: Monophyletic only if Cuscutaceae included, as treated here. Ipomoea cairica (L.) Sweet, Ipomoea hederacea Jacq. [Ipomoea nil L., misappl. ], Ipomoea indica (Burm.) Merr. (including Ipomoea mutabilis Ker Gawl. ), Ipomoea purpurea (L.) Roth, Ipomoea triloba L., all included in TJM (1993), not naturalized. Habit: Vine, annual (perennial herb if on perennial host), not in contact with ground, attached to, holoparasitic on host by many small, specialized roots (haustoria) along stem, generally glabrous. Stem: thread-like, +- green, yellow, orange, or +- red. Leaf: 0 or scale-like, alternate, +- 2 mm. Inflorescence: generally cyme, head- to panicle-like (flowers 1), subtended by 0--3 bracts. Flower: bisexual, radial, parts generally in 4s or 5s; calyx generally divided 2/5--3/5, persistent, generally +- cream-white; corolla generally +- white, persistent (withered in fruit) or not, tube cup-shaped to cylindric, bulged or horizontally ridged below lobes or generally not, generally with scales subtending stamens, lobes alternate stamens, erect to reflexed; ovary superior, chambers 2, each 2-ovuled, styles 2, generally free, persistent, stigmas 2, generally spheric, persistent. Fruit: capsule, generally indehiscent to irregularly dehiscent (or circumscissile near base), spheric to ovoid, depressed or not, thickened and/or raised around generally inconspicuous opening between styles or not. Seed: 1--4; coat papillate when hydrated, honeycombed when dry, (rarely neither, with cells +- rectangular, in +- jigsaw-puzzle-like arrangement); embryo generally slender, 1--3-coiled. Species In Genus: +- 180 species: cosmopolitan, especially warmer regions of western hemisphere and Polynesia. Etymology: (Aramaic, Hebrew; from the verb K-S-Y (Kaph, Shin, Yodh), to cover, from habit) Note: By persistent, withered corolla, fruit may be "capped" (corolla on top of fruit), "surrounded" (fruit at least in part visible, corolla +- loosely around fruit), or "enclosed" (fruit not visible, corolla +- tightly around fruit). Cuscuta pentagona Engelm. excluded. Inflorescence: head- to panicle-like, flowers 3--20; pedicels (0.5)1--2.5(3) mm. 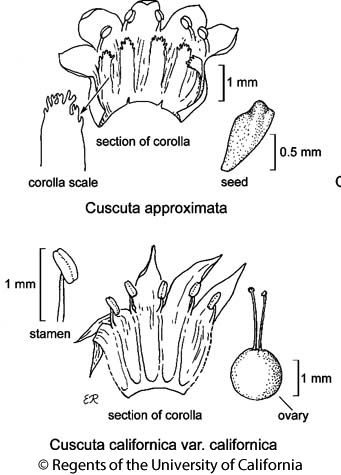 Flower: 3--5(5.5) mm, papillate or not, parts in 5s; calyx 3/4 to = corolla tube, bell-shaped, generally divided 1/2--2/3, not veined, shiny when membranous, not shiny when fleshy, lobes triangular to lanceolate, bases overlapped, margins entire, tip acute to acuminate; corolla tube 1.6--2.4 mm, bell-shaped, bulged below lobes or not, scales 0, lobes erect, reflexed in age, >= tube, narrowly lanceolate, margins entire, tips acute to acuminate, straight; anthers exserted, 0.6--1 mm, oblong to linear; styles 1.2--2.2 mm, >= ovary. Fruit: 1.5--2.2 mm, 1.2--2.5 mm wide, spheric or ovoid-conic, tip pointed or not, not thickened or raised around opening between styles, not translucent, +- enclosed by corolla (top barely visible). Seed: 1--4, 0.9--1.3 mm, 0.8--1.1 mm wide, widely elliptic to obovate. Flower: perianth (and pedicel) not papillate; filaments 0.5--1.1 mm; ovary (and fruit) spheric to spheric-depressed. Seed: (1)2--4. Citation for this treatment: Mihai Costea & Saša Stefanovi&cacute; 2012, Cuscuta californica var. californica, in Jepson Flora Project (eds.) Jepson eFlora, http://ucjeps.berkeley.edu/eflora/eflora_display.php?tid=57184, accessed on April 24, 2019. CA-FP, SNE; Markers link to CCH specimen records. Yellow markers indicate records that may provide evidence for eFlora range revision or may have georeferencing or identification issues. Purple markers indicate specimens collected from a garden, greenhouse, or other non-wild location.